The Mississippi Workers' Compensation Poster is a workers compensation law poster by the Mississippi Department Of Employment Security. This is a mandatory posting for all employers in Mississippi, and businesses who fail to comply may be subject to fines or sanctions. This poster must be posted in a conspicuous place where all employees will see it. This poster describes what to do if injured in the workplace as well as what insurers must do if a claim is filed and what an employee filing for workers' compensation can do and what happens for those who file false claims of unemployment. It appears you don't have a PDF plugin for this browser. 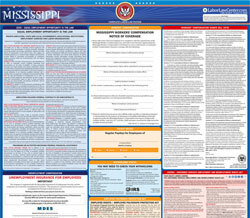 Please see the link below to download mississippi-noticeofcoverageform.pdf. conviction be subjected to the penalties therein provided.